Presenter engages teens with fascinating facts about fuel cells. 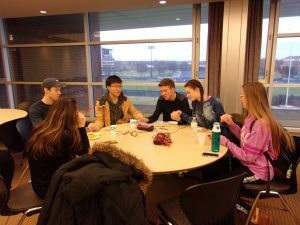 University of Akron’s Freshman Science Café on fuel cells and battery technology was a hit. Professor Kraft from the Department of Engineering and Science Technology described how both work and compared them for efficiency and environmental impacts. Batteries have amazing advantages but some important disadvantages, including creating hazards in the environment. 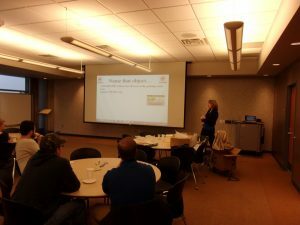 Amazing facts and statistics regarding the use of batteries were discussed. For example, it is estimated that over 5 billion batteries are thrown away every year in the world! Batteries contain a number of toxic and carcinogenic chemicals which can have a devastating impact on the environment. Fuel cells can offer an alternative that are more environmentally-friendly. They are made by using the energy of hydrogen and another fuel to create a more clean and efficient electricity. Students discussed advantages and disadvantages from their personal experiences. They also discussed the number of gadgets they use everyday that contain batteries. The potential impact on the environment is amazing! Wondering what a fuel cell is? Do you know how fuel cells work? 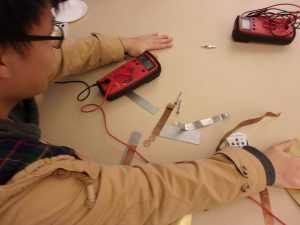 Students measure the voltage produced by the fuel cells as they hold hands to create human battery. Student tests different combinations of electrodes in creating a battery. Then test the power of a fuel cell. Students constructed from kits race cars powered by fuel cells. The cars, which used fuel cells that required salt water to complete the electrical connection, were easy to assemble. Students were permitted to make modifications to their design for better speed. The students worked in teams and prizes were awarded for the fastest car. The winner of the competition hooked his fuel cell car to a Duracell battery that he happened to have in his pocket. The car was the fastest despite the added weight of the battery. This was a great way to demonstrate that each technology is capable of producing energy for the same purpose. However, when you consider the environmental impacts, the choice becomes obvious. For other Cafés that focused on clean energy see Solar Panels and Electric Cars: Can these be the future in Taos? To learn more about fuel cells, check out this link at the Department of Energy! Check out these car kits that use fuel cells similar to the ones used in this café.